I've received several emails asking about the doll in this post's photo, which has reminded me that I have yet to introduce you to Margaret, Adelaide's doll, and to tell you about the fabulous place she came from. Margaret came from Peru, via The Qewar Project, a 'social work initiative' in the Andes Mountains. Using their words, The Qewar Project works with "the indigenous women of the village community of Andahuaylillas, the Project is engaged in creating and atmosphere which fosters self-esteem, personal growth, and a way to gain economic independence through learning skills in a humane and respectful working environment." Rock on. 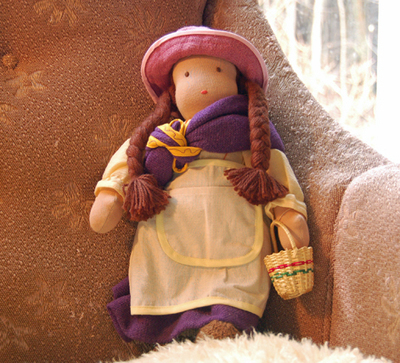 (You can read a lot more about the organization's history and doll-making process on thier website). The Qewar Project is also where we found Ezra's doll Stanley a few years ago. And having seen that one dragged *everywhere* and anywhere for two years now, I can say that in addition to being beautiful, these dolls are made so well and thoughtfully, and that Stanley is in as good shape as when he first arrived to us. 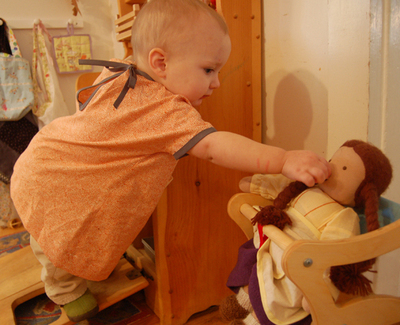 (The same cannot be said about the other commercially-bought and Waldorf dolls in our home, I have to say.) I thought (for about five minutes) about making Adelaide her doll (this is a wonderful resource if you're interested), but there's no way I could have matched the quality, and quite honestly, I'm thrilled to be able to support this Project in the little ways I can. Margaret's still a little big yet for Adelaide to be toting her everywhere, but surely it's only a matter of time before Margaret will be along for the ride too. For now, she does a lot of eating.